Nasir Nasrallah creates his own worlds. Using greyscale photographs and images, he draws over them with crayons of every colour, changing concrete into oceans, electrical wires into festival lights and phone booths into living creatures. Little by little he brings life and colour into everyday objects and recreates every childhood fantasy. He has a style that retains a childlike curiosity and playfulness. Crayon lines remain rough and raw and Nasrallah refuses to colour within the boundaries of objects. Melanchology drawings of women sitting at windows of multi-colour frames, fish that swim in the air and smiling suns commonly repeat themselves across his different works. For Nasrallah, making art is about experimenting with and synthesizing materials. His work is a highly personal response to his environment, the people and places that he comes across. He wishes to communicate his inner life to the viewer for his art is a direct result of his thoughts, feelings and desires. Nasrallah also has a habit of collecting found items such as toys, small consumer items, buttons, paper, wood and pieces of hardware, which he incorporates into his work. Nasrallah has a Bachelor of English in Telecommunication Engineering from Khalifa University in Sharjah and attended art courses at the Emirates Fine Arts Society whilst participating in exhibitions inside and outside the UAE. Including the Annual Exhibition of the Emirates Fine Art Society and the Cairo Biannual in 2006. Nasrallah currently holds the position of Vice President of Emirates Fine Art Society and is an Ambassador for the UAE Board on Books for Young People. 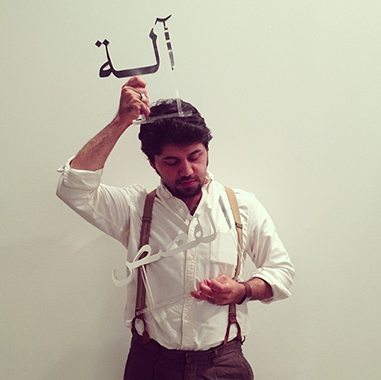 He has also participated in the 2013 Sharjah Biennial and 2013 Art Dubai, and he is the founder of “The Little Studio” publishing company. For his artwork in Capsule Arts limited edition art prints, Nasir Nasrallah will be featuring works from his Black and White Stories collection available to purchase at capsulearts.com, for more details about his featured artworks and the launch collection sign up here.